Ruth's Chris Steak House is a chain of over 100 steakhouses across the United States, Canada and Mexico. The restaurant is regarded as an upscale fine dining establishment, marking a gradual elevation in its status since its founding in the 1960s. 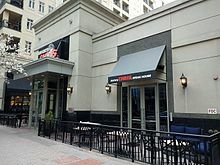 Ruth's Chris is currently the largest luxury steakhouse company in number of locations, operating income, and overall profit, larger than The Palm and Morton's. On May 22, 2008, the company underwent rebranding and became part of Ruth's Hospitality Group after its acquisition of Mitchell's Fish Market. The group has its headquarters in Winter Park, Florida. Chris Steak House was founded on February 27, 1927 by New Orleans entrepreneur Chris Matulich. It was located at 1100 North Broad Street near the Fair Grounds Race Course, seated 60 people, and had no parking lot. During Matulich's 38-year management, the business was sold six times, failing each time, and enabling him to buy the restaurant back cheaply from the purchasers. Ruth Fertel was a divorced single mother who needed money to send her teenage sons to college. Ignoring the advice of her banker, lawyer, and friends, Ruth purchased the restaurant in 1965. She used her brother's restaurant, Sig's Antique Restaurant in Port Sulphur, Louisiana, along with family recipes to lay the foundation for her restaurant. She initially planned to raise just $18,000 to cover the purchase price, until it was pointed out to her that she would need an additional $4,000 to cover the cost of renovations and food. On her first day, May 24, 1965, she sold 35 steaks at $5 each. Fertel personally took a hand in every part of the business. She had to teach herself how to butcher steak, and despite being just five-foot-two and 110-pounds, would saw up 30-pound short loins by hand until she could afford an electric band saw. She staffed her restaurant with single mothers, saying that they were hard workers and reliable. For many years, Chris Steak House was the only upscale restaurant in New Orleans with an all-female wait staff. From the beginning, her restaurant attracted local politicians as well as athletes, businessmen and reporters. Political reporter Rosemary James noted that she "would not have missed a Friday before a major election at Ruth's Chris Steak House. That was the place to be if you wanted to get some scoops." Local celebrities like Fats Domino were regulars. In early 1976, shortly after Fertel signed a new ten-year lease on the restaurant, a fire destroyed the building. Fertel had recently acquired a second property nearby to rent out as a party space. Within seven days, she had relocated the restaurant to its new location a few blocks away at 711 North Broad Street and re-opened it, expanding to 160 seats in the process. The sales agreement with Matulich prevented her from using the original name at any other address, so she named the new restaurant Ruth's Chris Steak House in order to keep some continuity with the previous location. She admitted later to Fortune Magazine that "I've always hated the name, but we've always managed to work around it." The first franchised restaurant was opened in 1977 by a loyal customer, Thomas J. "T. J." Moran (c. 1931–2015), in Baton Rouge, who went on to open several more franchised Ruth's Chris locations, TJ Ribs, and Ruffino’s restaurants through his company T.J. Moran Associates. Fertel noted, "All our franchisees were people who had eaten at one time or another in one of our restaurants. We never looked for franchisees. They came to us." The chain expanded rapidly over the next two decades, with 66 locations in the U.S. and overseas by mid-1998, and achieving over $200 million in annual revenues. This success earned Fertel a number of accolades as an entrepreneur, and the epithet The First Lady of American Restaurants or The Empress of Steak. In 1999, Fertel, then 72, developed lung cancer. She sold a 79.3 percent interest in the chain in August 1999 to investment company Madison Dearborn Partners of Chicago, remaining as a shareholder until her death in 2002. On August 9, 2005, under President & CEO Craig Miller, Ruth's Chris Steak House became a public company following a successful IPO valuing the company at $235 million and an increase of 15 percent in first-day trading. In late August 2005 Hurricane Katrina devastated Greater New Orleans (see: Effect of Hurricane Katrina on New Orleans), and the chain moved its corporate headquarters to Heathrow, Florida. Like most businesses in the city, two of the chain's locations in the New Orleans area were forced to close because of the storm. The Metairie location has since reopened. Members of the Fertel family, particularly Ruth's son Randy, were bitterly opposed to the move. Amid much criticism by local officials and media, and on the heels of the announcement by Morton's that it would reopen its own New Orleans branch, the corporate offices announced that, due to extensive damage, the old flagship location on Broad Street would be permanently closed and donated to charity. Tulane University was the recipient of the gift, remodeling and reopening the site in 2012 as the Ruth U. Fertel/Tulane Community Health Center. In May 2008, Ruth's Chris reopened in New Orleans and is centrally located downtown in Harrah's Hotel at 525 Fulton Street. In 2011, the corporate headquarters was relocated to its current location in Winter Park, Florida. In February 2008, the company purchased the Mitchell's Fish Restaurant and Columbus Fish Market brands from Cameron Mitchell Restaurants for $92 million. As the recession began to bite, the acquisition was not initially successful. The stock price fell from $22 in 2006 to under $5 and company debts rose to $185 million. CFO Tom Pennison resigned, and CEO Craig Miller was ousted by the board to be replaced by Mike O'Donnell. O'Donnell restructured and rebranded the company, creating Ruth's Hospitality Group (RHGI) as the parent entity in May 2008, allowing each of the individual restaurant brands to have their own identity within the group. The current President and COO is Kevin Toomy, formerly owner and president of the award-winning Goldcoast Seafood Grill in South Florida. In February 2013, RHGI reported that fourth quarter sales at Ruth's Chris restaurants were up by 7.0 percent on the previous year, representing the 11th consecutive quarterly increase in sales. Ruth's Chris continues to add new restaurants, most recently in Harrah's casino in Las Vegas in January 2013, after the previous Las Vegas location on Flamingo closed in 2009. The company has announced plans for 2013 that include an expansion into China, a new restaurant in Denver, Colorado, and four or five new franchised locations. In 2015, it was announced that the restaurant was expanding into Albuquerque, New Mexico. In 2016, Ruth's Chris opened its restaurant in Odenton, Maryland. In 2018, Ruth's Chris opened its newest restaurant at the Silver Legacy in Reno, Nevada which replaced Sterling's Seafood Steakhouse that had been in business from 1995 to 2018. Most restaurants are open for dinner only, although some locations also offer lunch. The dress code is usually a range from business/dressy to business casual. Most locations have private dining facilities and offer business communications via satellite. The company also offers outside catering and a wedding service through the Ruth's Weddings brand. The restaurant's signature is serving USDA prime steaks that are seared at 1800° Fahrenheit (approximately 980 °C) and served on ceramic plates heated to 500° Fahrenheit (260 °C). Half an ounce (1 Tbsp) of butter is added just before the plates leave the kitchen in order to create the signature 'sizzle'. Fertel firmly believed that the success of her steaks was due as much to the sound and smell of the 'sizzle' as well as the taste. "You hear that sizzle, and you think, 'I wonder if that's my steak'", she commented in an interview shortly before her death. Portions generally are large enough to serve two or more diners. Family style side dishes include au gratin potatoes, topped with a bechamel sauce and Cheddar cheese. Some recipes, such as the BBQ shrimp, New Orleans style creamed spinach or the sweet potato casserole, are traditional 19th century Louisiana recipes that originate with Ruth Fertel's family, particularly her great-uncle Martin, a Louisiana Delta farmer from a French-Alsatian family. Some of these recipes have been made publicly available by the family and by the company. Also available are dessert selections, with the restaurant's signature creme brulee being a staple item throughout the chain. In 2009, Ruth's Chris introduced their "Ruth's Classics" menu of prix fixe meals where guests choose a three-course meal; starter, entree and side, and dessert. This menu is updated seasonally every three months. The wine list includes over 200 wines, primarily from leading Californian vineyards such as Mondavi, Beringer and Stag's Leap. Twenty-five or more wines are available by the glass, depending on location. The seasonal "vintage-inspired" cocktail selection, introduced in 2011 by Beverage Director Helen Mackey, includes both classic and contemporary "hand-crafted" cocktails. ^ "Ruth's Hospitality Group, Inc. | Company profile from Hoover's | 407-333-7440". Hoovers.com. October 21, 2010. Retrieved January 25, 2012. ^ "Ruth's Chris Steak House". Funding Universe. Retrieved April 22, 2007. ^ Farkis, David (December 1, 2005). "Raising the Stakes". Chain Leader Magazine. Retrieved April 22, 2007. ^ "Heathrow CDP, Florida Archived 2011-06-06 at the Wayback Machine." U.S. Census Bureau. Retrieved on February 26, 2010. ^ "Home Office Archived 2010-02-25 at the Wayback Machine." Ruth's Hospitality Group. Retrieved on February 26, 2010. ^ "Ruth Fertel: A Pioneer in the Restaurant Industryauthor= Katie Bloor & Linda J Shea". HTM 591S – Foundations in Hospitality and Tourism Management. University of Massachusetts Amherst. Archived from the original on April 2, 2015. Retrieved February 4, 2013. ^ Randy Fertel. "The BP Oil Spill and the Bounty of Plaquemines Parish". Gastronomica The Journal of Critical Food Studies. Retrieved January 2, 2015. ^ "Steamroller – Ruth Fertel". Capitalist Chicks. Retrieved February 4, 2013. ^ a b c d "Her Life Is The Stuff Of Legend" (PDF). Archived from the original (PDF) on October 24, 2013. Retrieved February 4, 2013. ^ "Randy Fertel, philanthropist and son of steakhouse founder Ruth and 'Gorilla Man' Rodney puts family's legacy into print". The Times-Picayune. Retrieved February 4, 2013. ^ a b "An Author Finds His Therapy Inside A Family Memoir". De Soto: Exploring the South. January 2012. Retrieved February 4, 2013. ^ McDowell, Bill, "Ruth's Chris Steak House," Restaurants & Institutions, August 1, 1994, 54. ^ "Ruth Fertel of Steakhouse Fame Is Dead at 75". NY Times. April 18, 2002. Retrieved February 4, 2013. ^ "So Just What Does 'Ruth's Chris' Mean?". CNN Money. July 6, 1998. Archived from the original on April 9, 2013. Retrieved February 19, 2013. ^ "Never Give Up: Ruth's Chris Steak House," Entrepreneur Magazine, September 1997, 81. ^ a b "Madison Dearborn Finds Ruth's Chris To Be Tasty Morsel". Chicago Tribune. July 20, 1999. Retrieved February 19, 2013. ^ "Ruth's Chris IPO to raise $235M". Tampa Bay Business Journal. April 25, 2005. Retrieved February 19, 2013. ^ "Ruth's Chris Steak IPO sizzles". Wall Street Journal. August 9, 2005. Archived from the original on April 11, 2013. Retrieved February 19, 2013. ^ Dash, Craig (September 5, 2005). "Ruth Built the Steakhouse. Katrina Intervened". New York Times. Retrieved April 22, 2007. ^ Fitzmorris, Tim (February 27, 2006). "Morton's beefs up city's diminished steak offerings". New Orleans City Business. Archived from the original on September 28, 2007. Retrieved April 22, 2007. ^ Press Release Archived December 31, 2006, at the Wayback Machine, Ruth's Chris Steakhouse, Inc., November 18, 2005. ^ Rickard, Mary (April 25, 2012). "Fertel Tulane health clinic moves to new home in Mid-City". Times-Picayune. Retrieved November 26, 2013. ^ "Ruth's Hospitality Group moving to Winter Park". Orlando Sentinel, July 20, 2011. Retrieved February 19, 2013. ^ "Home Suite Home". Winter Park Magazine. Archived from the original on April 12, 2013. Retrieved February 19, 2013. ^ "Ruth's Chris Completes Acquisition of Mitchell's". Seafood Source, 20 February 2008. Retrieved February 19, 2013. ^ "GOP Senate hopeful defends moving Ruth's Chris HQ here after Katrina". Orlando Sentinel, 7 Sept, 2011. Retrieved February 19, 2013. ^ "Former Ruth's Chris CEO Craig Miller joins Republican field for U.S. Senate". Tampa Bay Times. July 12, 2011. Archived from the original on January 29, 2012. Retrieved February 19, 2013. ^ a b "Ruth's Hospitality Group, Inc. Reports Full Year and Fourth Quarter 2012 Financial Results". Retrieved February 19, 2013. ^ "Ruth's Chris Rumbles Back into Las Vegas". Retrieved February 19, 2013. ^ "Ruth's Chris on Flamingo closing". Las Vegas Review-Journal, 8 August 2009. Retrieved February 19, 2013. ^ "Ruth's Chris Steak House Expands Global Presence to China". Retrieved February 19, 2013. ^ Jessica Dyer (May 6, 2015). "Ruth's Chris Steak House coming to Albuquerque". Albuquerque Journal. ^ "Ruth's Chris Private Dining". Retrieved February 20, 2013. ^ "Ruth's Weddings". Retrieved February 20, 2013. ^ Savor Perfection with a Steak from Ruth's Chris Steak House Archived June 30, 2007, at the Wayback Machine, Ruth's Chris Steak House, accessed July 2, 2007. ^ a b Sample menu Archived April 5, 2007, at the Wayback Machine, ruthschris.com, accessed April 22, 2007. ^ "The origin of Ruth's Chris Creamed Spinach recipe". The Times-Picayune. November 30, 2012. Retrieved February 19, 2013. ^ "Ruth's Chris Taps Growth Opportunity With Creative By The Glass Wine Program". Shanken News Daily. July 7, 2011. Retrieved February 19, 2013. ^ "Ruth's Chris Steak House Introduces a New Vintage-Inspired Cocktail Program". Restaurant Magazine. Retrieved February 19, 2013. This page was last edited on 30 March 2019, at 12:11 (UTC).